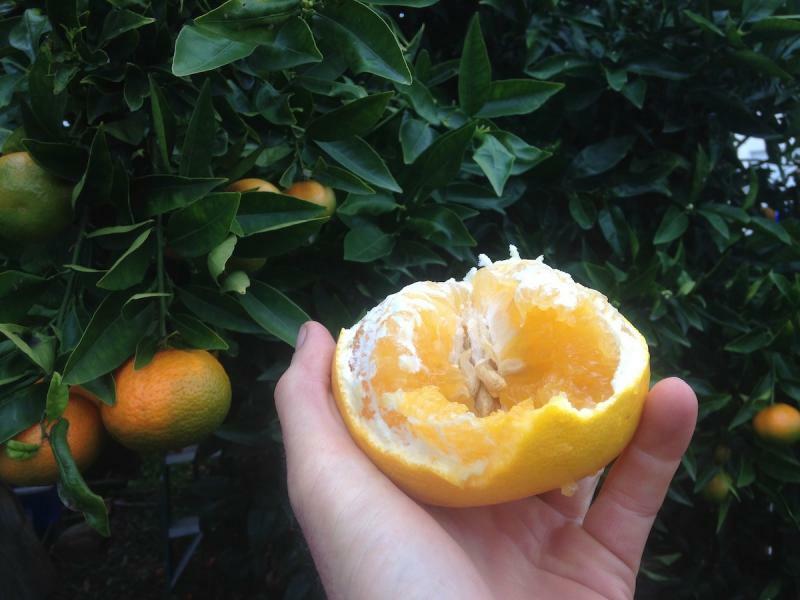 This is 'Cocktail' mandelo, a mandarin x pummelo hybrid. The fruit is beautifully flavored with usually low acidity with a mild grapefruit flavor and refreshingly sweet. The flesh is golden colored; grapefruit sized fruit. 'Cocktail' is a very productive variety and does well from at least coastal to foothill locations. The tangerine/mandarin fruits in the background on the tree are the 'Clementine' mandarin/tangerine. Mandarin and Tangerine can be considered synonymous terms, but, Tangerine typically refers to the varieties which had a history of growing in the Mediterranean region (origin of the species is eastern Asia within the span of human migration history), such as Algeria, where Tangiers is. And hence, with procurements of distinguishable Citrus of the sort from that locale, it was decided by some of the authorities to refer to the particular Citrus as Tangerines.